At three months old, this baby iguana has more than doubled its hatchling weight and will soon be 5-6 feet long or bigger! Many impulsive iguana purchases are followed with buyer’s remorse. I’m sorry, but I don’t know of anywhere that has an opening for iguanas. Unfortunately it’s a more complex issue than you may realize. I don’t have an easy solution, but we’ve organized some information that may help you understand the issue better. If you’re willing to invest some time and effort, there are options for your own pet iguana. I hope this helps! Millions of iguanas are bred in Central and South American lizard farms and imported for the pet trade. These iguanas are often sold on a whim at fairs, boardwalks, and dollar stores, and many become impulse pets to uninformed consumers. 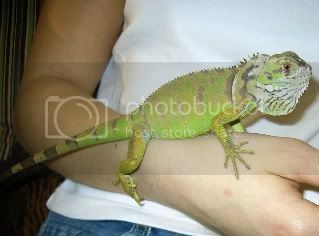 As hatchlings, iguanas are the size of a mouse and are one of the least expensive lizards in the pet store. But many impulsive owners don’t know iguanas are one of the largest tree-climbing lizards in the world, requiring vast amounts of space and special lighting. 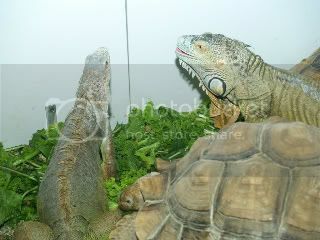 Appropriate setups can cost hundreds or thousands of dollars as iguanas grow to 5 or 6 feet or longer! They are the reptile species most often turned in to rescues, and the species LEAST adopted from rescues. Because they are farmed in poor countries, they are one of the most profitable and exploited reptiles in the pet trade. Some large pet companies, like PetSmart, have actually stopped selling iguanas due to ethical concerns, while still acknowledging iguanas were their most profitable reptile. Unfortunately many pet stores and unscrupulous dealers continue to import hatchling iguanas faster than abandoned adult iguanas can find homes. This leaves reptile rescues with a major problem. 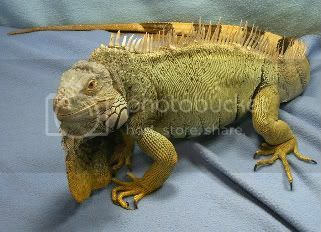 It can take months or years to find a suitable home for a large iguana! This is not acceptable, as we receive several weekly or daily calls from folks needing to place them. Our first priority is to care for the animals already at the rescue, and we simply cannot take in more animals than we can care for. Forgotten Friend has maintained two or more iguanas at our facility for many years, which take up more space than any other reptiles in our care. We simply don’t have space for more. Your best bet is to find the time and space for your iguana. This may not be easy, and I understand that for some folks, it may not be possible at all. 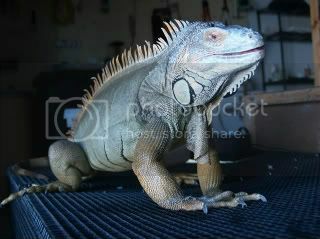 1) Post your iguanas for adoption on our Facebook page, or place a newspaper or craigslist ad. This gives you a chance to screen prospective adopters so you know where your turtle is going. You are welcome to use our own adoption application as a screening guide (www.forgottenfriend.org/apply). Click here to learn how to post on our Facebook page. 2) Give it to a friend/family member. 3) Put flyers up at your local vets/pet stores. Many of these places allow adoptable pet fliers, and That Fish Place in Lancaster, PA occasionally will take in iguanas to resell if they have room. Realize that simply letting your iguana “loose” in the wild is illegal, unethical, and may cause serious damage to wildlife in your area. Released iguanas will die in northern states, and may become invasive species in the extreme southern states. Option 4 is never pleasant, but could certainly end up being a better alternative than the above. We wish we could do more to help, but the problem is much bigger than we are. Thanks to Bonnie Keller and VA Reptile Rescue for developing much of this page. This iguana came from a great home, but was given up after a serious bite during seasonal aggression. 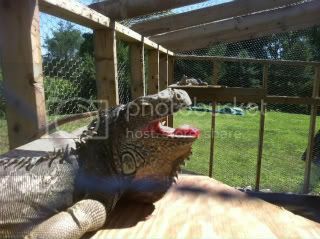 This iguana, “Jorge,” was a popular classroom pet until he bit a student who was reaching in to change the water bowl. Even though iguanas can be very friendly, they require experienced handlers to avoid mishaps. Don’t try this at home, but some times we let our herbivores enjoy group dining. 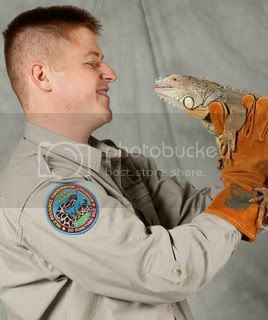 Forgotten Friend founder Jesse Rothacker with Boo, a female iguana who has lived with us for nearly ten years. Boo and Isadore, our two resident iguanas, enjoy outdoor basking in the Summer.